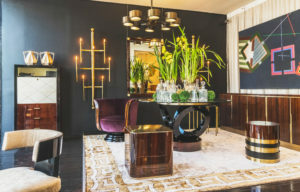 Luxury interior design firm ZEHANA runs their own blog that highlights high-end showrooms in the design hub of Los Angeles, that specialize in wood workmanship and beautiful design all around. They featured us for their February post and did an extensive interview with Miriam Hauck. Read below the full interview and have a peak at some images they took of our showroom. To see the original blog post about us on their site, click here. 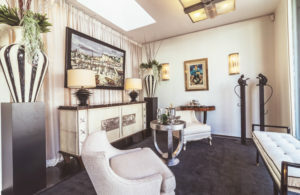 Stepping in to the elegant high-end showroom of Anne Hauck on Melrose, I was instantly greeted by the very detail-oriented Miriam, the daughter of the owner. Going through the showroom, she explained to me the exact materials, construction methods, and history behind each piece, (and there are a lot of pieces). This was excellent for me, because if there is one thing I like almost as much as fine craftsmanship, it’s design history. 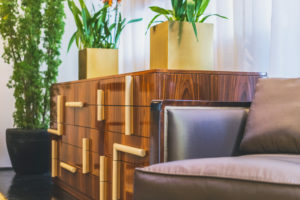 We sat down to chat about the history of Anne Hauck, Art Deco, the 20th Century and Wood Veneers! Not enough discussion on Yacht Interior Design theory for you? Then let not tears despoil your cheeks, dear reader, because we discuss that, too! Eric: Can you tell me a little bit of the history of Anne Hauck? Miriam: Absolutely, it’s a family business that my mother, Anne, founded in Germany about 30 years ago. And when she moved to the States, we distinctly focused on really high-end Art Deco, to be specific: French Art Deco because that’s where the movement actually started. It then trickled down to the UK, to Germany, and to America. But, if you actually compare all the styles, they are very different! The French style is the most elegant and sophisticated of them all, so that’s what we really honed in on. We focused on authemtic pieces that were signed by the famous craftsmen of that era, showcased in books, had a provenance, and that were really special due to their design and the luxurious materials used on each piece. At that time, nobody was doing really high-end Art Deco in Los Angeles on a larger and sophisticated scale. Because of our unique selections and provenance pieces, a lot of designers were buying from us and we started getting known in the community. Then we started receiving more and more questions about customizing pieces. Because of all the interest in customization, we decided to launch our own production line. First, we focused on Art Deco reproductions, but as time progressed we decided to design our own creations and go a little bit more streamline and contemporary. It wouldn’t just have to be Art Deco; it would be more modern, while staying true to our Art Deco roots. For example, with our Leona Coffee Table, it’s actually not Art Deco at all. It’s super modern and streamlined, but because we chose an Art Deco wood veneer, it suddenly gives it an that Deco look. You can really play with materials and therefore transform a piece completely, which will allow it to fit into a Traditional home or an Ultra-Modern Penthouse for example. But it really comes down to materials, and that’s what we really pride ourselves on today, our specialty offering of exotic wood veneers. 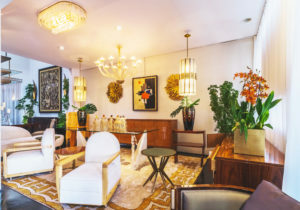 That’s the underlining thread that connects our showroom, visually at least- our 20th century furnishings with our own customized collection line. Eric: So you are pushing the envelope as well, as opposed to just staying rooted only in tradition? M: Yeah, we’re pushing the envelope on a lot of things! We’re rebranding at the moment, and you know our clients come to us for the Art Deco, but we have a lot of pieces from Mid-Century all the way to the 1980’s. So we’re kind of focusing more on 20th century design in general because that era had so many incredible designs and artisans that we really wanted to highlight great design in all aspects. So instead of just focusing on the 1920s to the 1940s, which would be the Art Deco period, we’re kind of expanding to the entire 20th Century, just with designs that interest us. We have our own line, which we launched about 10 years ago, of customizable pieces, but staying more true to Art Deco. And just a few months ago, we launched our Studio Line, which is much more modern and streamlined. It goes away from Art Deco a bit, and the price point more affordable to the general public. We wanted to introduce our Studio Line as still high-end with and array of alternative woods, but less specialty veneers with a focus on matte but also still high gloss finishes. We offer it at a lower price point than our classic Anne Hauck line and therefore it is also a great option for hospitality or commercial projects. E: Where do you think Design Trends are going at the moment? M: Well, I think the whole eclectic movement is really big, and I think obviously brass plays a big part in it. But if you look at spaces, it’s playing with different shapes, different colors, also going in to retro colorations like pastels, which wasn’t normally a thing. I think also the 20th Century right now is really hot, because you can find a really good Art Deco desk and pair it with Mid-Century chairs. Or find a 1980’s, very Avant-Garde sculpture for a dining table top. I think to play with different shapes and with different periods is really interesting, and if you look at Social Media, like Instagram for example, the things that are really interesting are the combinations of different periods of the 20th Century and Avant-garde shapes. E: If you had an unlimited budget and space, what would your dream entry-way to a home look like? M: I would love it to be two story, and have a really cool chandelier in the center. Not traditional, like a crystal chandelier, but something ultra-modern that is maybe asymmetrical with exposed light bulbs. And then have an asymmetrical carpet with different shapes, more like an Eileen Gray carpet. She was really big in the 40s and really honed in on geometrical designs, and then solid colors within those asymmetrical designs. Her designs are classic, but at the same time very trendy right now. I would then place a very minimal, streamlined bench with a fun fabric and possibly a wild Mid-Century mirror on an empty wall. Keeping everything clean-lined allows each piece to stand out. I like minimal, but I love mixing periods too. Art Deco is such an interesting period, and has set the bar for design since it began, and will continue to do so far into the future. Art Deco was the start of the modern movement- the geometric shapes and streamline designs- but it also has so much history, incorporating styles from the African, Egyptian and Greek periods. Yet through its focus on stylizing all decorative elements, it made the period modern. That’s why it mixes so well, with everything to Mid-Century or with something really contemporary, Avant-Garde or even something more traditional like Biedermeyer. I would always have some Art Deco pieces somewhere. E: You mentioned how Art Deco is the start of the modern movement, and we were talking earlier about Los Angeles’ love affair with Art Deco Architecture and Design. What do you think it is about Art Deco that goes so well with LA? M: I think it’s also an architectural form that’s really fascinating, even if you compare it with New York and Miami. Everyone is drawn towards that style of architecture. It’s one of the most iconic eras of construction. The decorative elements are stylized adding interesting elements to an otherwise geometric and streamlined facade. There’s always some great detail to take away from an Art Deco building and incorporate it into a home’s interior or a piece of furniture. E: What advice would you give to a lay person who doesn’t really know much about design, but who wants to kick things up a notch in their own home? M: My advice would be to always incorporate something that is vintage or antique. I think that’s what really brings character into a space! Sometimes, when you go into a shop and buy everything Modern, it loses its flair because there is nothing warm or historical about it. 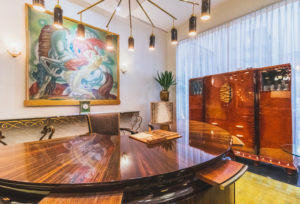 So even if you buy a new dining table and a custom sofa, your desk should be something special like from the 20’s, and then have your chairs be 1960’s Gio Ponte. 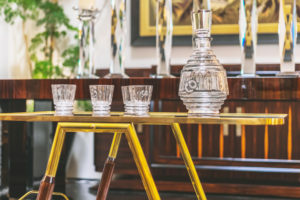 Some of those special pieces really pop, and when you have your friends or your family over, it looks curated and like you are well traveled when you have a few select pieces that are really ‘wow.’ Also, these items will stay with you forever and while you will get a new sofa a few years down the road, you can always restore the vintage item that you bought many years ago and make it new again. E: What’s something you might say to someone who doesn’t really know what they’re looking for and might be a little intimidated to come into such a high end shop? M: Because of our background in Art Deco, we know a lot about materials like wood veneers or finishing. And no matter what a client is looking for, let’s say they come in looking for a dining table or a coffee table: we also try to educate our clients in that sense because sometimes they might not be familiar with exotic woods, or why a table might look so beautiful – and it’s because of the grain of the wood veneer and not just made out of a simple wood like Maple for example. A veneer for example, is a ultra thin piece of wood that’s cut from the inside of a tree. Once a piece of furniture is crafted, then that veneer gets pressed onto it in a bookmatched pattern or a starburst design to give it a really special aesthetic. We try to educate and involve our clients in the history of creation. We also explain how we create our durable polyester lacquer, instead of just simply straying an item high gloss, that will eventually leave it vulnerable to scratches. We also use our polyester lacquer on our yacht projects because it protects the furnishings from the salty air and humidity. We want people to love what they buy and end up using it at home. Have the piece become part of the family and treasure it by sitting in that beautiful leather Deco chair, and if the leather becomes worn after 8 years, then just re-upholster it! And if the lacquer on the arms scratch? So What? We can always polish it out for you, but we want you to love the piece and it should bring you joy. I always try to bring a little educational level my interaction with our customers, so they understand what they’re buying and why it’s special, and why it’s unique from the other pieces they’re acquiring. E: I really want to hear more about these yacht projects. M: It’s funny because a lot of yachts are rooted in the streamlined Art Deco style. So even if it’s less ornate, and there are much less decorative elements, all the shapes are very streamlined. Also the wood on yachts are mainly exotic veneers like Macassar or Rosewood with high gloss finishes and expensive materials. A Yacht may have built in panels of all Macassar Ebony, and then a built-in dry bar that has Green Onyx paneling and a black lacquer fluted base. But all the shapes are streamlined so that once can tell it either is Art Deco or it alludes to it. E: So a high gloss finish and streamlined shapes are the secret to good yacht interior design? M: Yeah! Especially because you don’t have that much furniture on yachts, a lot of it is built in. So how do you make a high-end exclusive yacht look high-end without all that furniture, right? And that’s where exotic woods come into play, because you can do paneling, you can do a bar, or a lot of built-ins, but you can make it look really high end and unique, just by wood selection. E: Can you tell me a little bit more about your own lines. M: So we have two different lines now, with our Studio Line launching just now, in the winter. Our Anne Hauck line launched about 10 years ago, and because our company background is from Germany, we had our entire factory there. And then as the line here grew and we really produced so much on a daily basis, we actually relocated everything to LA. It was really important for us that our company has Production Control and Personal Quality Control. Because we are so detail oriented, we inspect every piece with a microscope, and we are very particular that the client really gets the best quality. We do produce here in Los Angeles, and have two different work rooms, one for furniture and one for upholstery. And then our studio line which just launched, has more of a Mid-Century flair, while also incorporating ultra modern design and even traditional ones as well. This line we are actually producing in Europe, our old stomping ground. We have a lot of metal work on that line, because we want to make it a little younger, a little fresher, and more contemporary. The machinery for all our metal pieces is in Europe and we actually send Air Freight containers every four weeks or so, which makes it an easy transition, because we source all of our antiques from France and Germany anyways. We also have our finishing work room for our antiques in Germany. As you can see, we are very international. We’re constantly shipping things back and forth, we’re buying there, we’re producing here, so it’s very global in that way, but it keeps things fresh and we are always traveling. My mother Anne, spends 6 months of the year here, and 6 months in Europe. She does all of our buying there and all of the cities we travel to always inspire us in different ways. She comes back to LA to check up on things, but she would stay in Europe full time if she could and just work on new designs and get inspired by new cultures. E: Are there any last things you want to say to the readers? M: I think, sometimes when I have a new client come in and say they aren’t doing Art Deco, they are surprised that an Art Deco piece can work really well for a traditional or an Ultra-Modern home. And Clients that have been working with us for over 15 years come in with their floor plans and say, “Miriam, I’m doing a traditional home, and I’m interested in this sofa, and that sideboard, and that table lamp!” Because of the way that they have already expanded their mind, it doesn’t have to be an Art Deco project to incorparte Art Deco, or 20th Century furnishings. Traditional design doesn’t have to always fall under the same lines of the “traditional” umbrella. And so if you have a designer who looks outside the box, they are able to incorporate things from Art Deco or Empire for example and make it work into a classical inspired home. I’m not saying the entire home should be like this, but it’s good to really know how to mix from different periods, and that’s what gives it a twist from the traditional home.